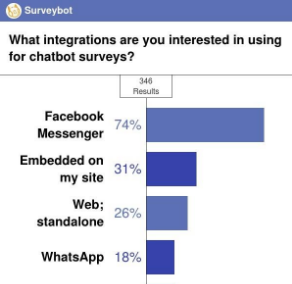 Chatbot polls are becoming immensely popular across various social media platforms as a fun, easy way to interact with your audience and gather information about them. They allow your audience to view results in real time. This means they can visually connect with how people have responded to your poll. This kind of engagement allows them to feel as if they’re getting a more interactive experience. It can be a great strategy to allow customers to feel as if they are part of something, rallying around a common interest. 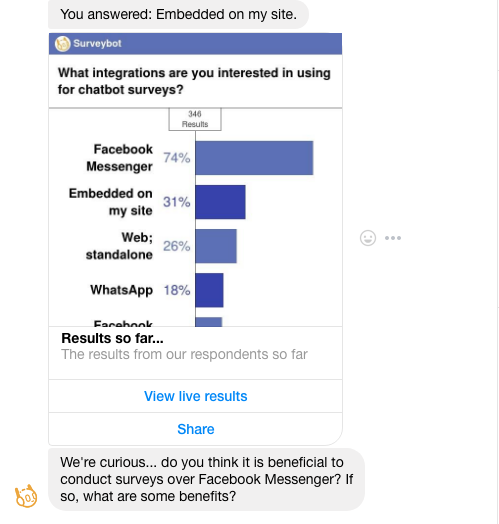 Surveybot is thus excited to announce a new feature: Chatbot polls! These allow you to add a poll feature to any multiple choice question. To use this feature, you create a survey as you normally would. Make sure you are using multiple choice questions. Then, add a results message to your poll. You can add this message to any of your multiple choice questions. When a person answers your multiple choice question in Facebook Messenger, your page will immediately respond with a bar chart. This shows a snapshot of the current responses to the poll. You can also create polls that involve multiple questions, and you can change the colours of the bars in your chart to suit your own preferences! Also, the top bar of the graph, where it says ‘Surveybot’ will be branded with your own logo. Respondents to your poll can use the ‘Share’ button to share their results on the web. They can also share the poll inside Messenger with any of their friends. Their friends can then do the poll, which can increase your number of responses. Both you and your audience can click on the ‘View live results’ button. This takes you to a new window like the one below where you can see the results of your poll updated in real time! This makes for a simple and engaging way for you to track how people are responding to your poll. It also allows your audience to connect more meaningfully with your surveys. This is because they can see how their response matches up with how others have answered. To check out how it looks in Messenger for yourself, have a go at out our example poll.